Comfort Zone | Pictures without film. From one end of the country to the other – Friendly Friday – Stay in your comfort zone. So my first photo is of ‘Long Meg and her daughters, a stone circle in Cumbria. Visiting stone circles and other ancient monuments can be both comfortable and uncomfortable. But Long Meg and her daughters is definitely a space where I feel at home, recharged and within my comfort zone. Also for double ‘comfort zone’ points this photo is a panoramic landscape made from a seven photo stitch, those of you who follow me know that taking such photos is also well within my comfort zone. The resultant file was some 20,000 pixels in width, the resultant image has been reduced somewhat for your viewing pleasure, the site often has cows, and therefore pats, and thus flies, the shear number of little black dots to be removed was probably verging to outside my comfort zone. ‘Panoramic Meg’, Long Meg and her daughters, Little Salkeld, Cumbria, 2017. My second photo is of St. Ives, taken from the comfortable zone of the cafe in the Tate art gallery. Visiting Cornwall is well within my comfort zone. 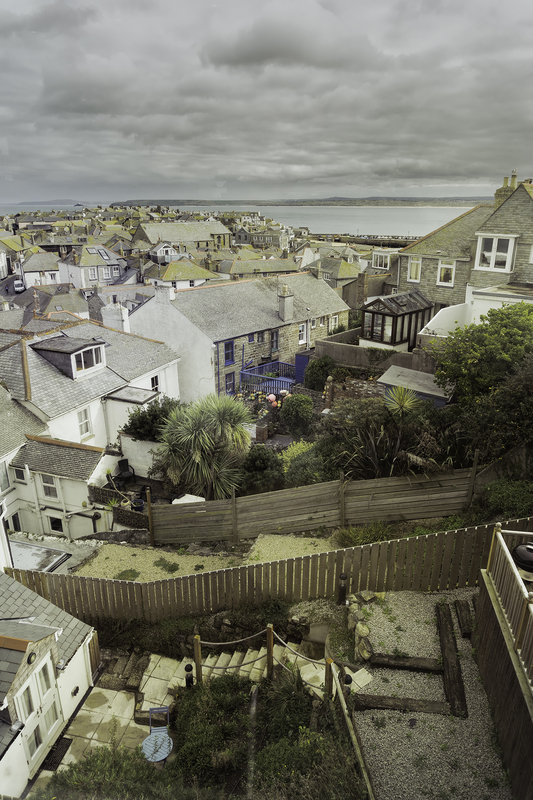 ‘Backstreets and gardens’, St. Ives, Cornwall, 2014.